Demonstrations will be held worldwide on July 24 to protest Beijing’s actions in the South China Sea. On Wednesday a new coalition of Philippine groups announced their intention to hold anti-China protests across the world on July 24. The West Philippine Sea (South China Sea) coalition said that it will convene protests over the South China Sea dispute on July 24 in various cities around the world, including Manila, various cities in the U.S., London, Rome, Sydney, Copenhagen, and Israel, among others, local media outlets reported, citing a press conference the coalition held on Wednesday. The protests will be held outside Chinese embassies and consulate buildings, the group said. The West Philippine Sea coalition is comprised of numerous former Philippine officials, led by former Interior Secretary Rafael Alunan III and including former National Security Adviser Rolio Golez. Local media described the coalition as consisting of “former government officials, youth leaders, netizens and even Filipino-Americans,” while others noted that musicians and artists would also be participating in the rallies. Vonz Santos, head of the NGO U.S. Pinoys for Good Governance, said his group was leading the effort in North America, where it is planning protests in Washington DC, Los Angeles, San Francisco, Chicago, Houston, Denver, and Atlanta. 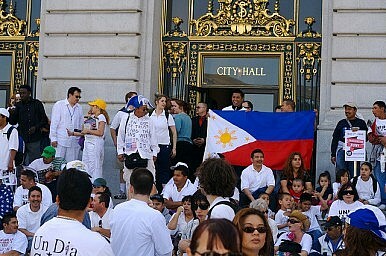 The U.S. Pinoys for Good Governance has previously organized protests in U.S. cities over the South China Sea issue, which have been attended by hundreds of people. The main site of the protests in the Philippines will be outside the Chinese Consulate in Makati City in metro Manila. Local newspapers said crowds of up to 5,000 people were expected to attend. A similar protest outside the Chinese Consulate in May 2012 only drew about 200 protestors, way below the expected number of attendees. Protests over sovereignty issues are common in much of the region, including Vietnam, which like the Philippines is often at odds with China over overlapping claims of sovereignty in the South China Sea. China itself has witnessed numerous anti-Japan protests, most recently last year after Japan moved to nationalize the Diaoyu/Senkaku Islands. China and the Philippines have been at odds over overlapping claims in the South China Sea for years, which has led to prolonged standoffs on a number of occasions. Last year a standoff over the Scarborough Shoal saw China effectively seize control of the area through conducting frequent patrols. The Philippines have sought to counter this move by bolstering its own defenses while strengthening ties to key allies like the United States and Japan. Last month the Philippines announced it was considering giving Washington and Tokyo increased access to a naval base in Subic Bay to both Washington and Tokyo. Reuters reported on Tuesday the agreement currently being negotiated between the U.S. and the Philippines is far more expansive than public announcements let on. The Philippines has also appealed to international tribunals to help mediate its dispute with China. Just this week the Philippines announced that a five-member tribunal under the U.N. Convention on the Law of the Sea had convened to hear Filipino complaints against China. The Philippines had asked China to join it in seeking international adjudication for their dispute, but Beijing demurred. It’s Time to Rethink Philippine Policies on ChinaThe Belt and Road: The Good, the Bad, and the MixedIt’s Time for a New Philippine Strategy Toward ChinaIn Philippines, Pompeo Offers Major Alliance Assurance on South China SeaWhy Is the Philippines the Home for Chinese Offshore Gambling?